Will the real Jesus please stand up! Lamb & Lion Ministries conducts a number of Bible conferences in the Dallas, Texas area each year. 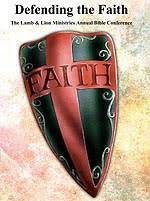 Our June 2010 conference theme was Defending the Faith. One of our guest speakers was Eric Barger, the founder and director of Take a Stand! Ministries headquartered in the Dallas area. Eric is an authority on the cults, the New Age, and rock music today. From his past as a former drug addict and rock n' roll musician who was deeply involved in the New Age movement, Eric has emerged since he gave his life to Jesus Christ to become one of today's greatest defenders of Christianity in America. Eric's topic at our conference was "The Truth of Jesus' Divinity" (watch). He did a remarkable job explaining that Jesus Christ is truly God in the flesh as the Bible teaches. I want to talk to you about Jesus — the real Jesus — versus the counterfeits. There are so many counterfeits out there. So many people are confused about this that I think we need a refresher course every once in a while about these kinds of things. We want to examine the divinity of Jesus to see who He really was. You may think that everybody knows who Jesus is. You know you live in a very, very churched area here. I've always called the Dallas-Ft. Worth area a very religious area. You understand what I mean when I say that, as 60% or so of the people in this area go to church. My ministry may be headquartered in Rowlett, Texas, but the actual county where my wife and I are currently living is in Washington State. We are living in Washington State to help her parents during this very trying time in their life with their health conditions. In Washington State and where I live in Pierce County Washington, it is the least churched county in the United States. Less than 1% of the people go to church regularly. We have a lot of religions, though. Sometimes religious people are hardest to get through to. You may think that everybody around you knows who Jesus is, but I guarantee you that when I became a Christian I had no concept that people actually read and followed the Bible. I didn't understand anything about the Christian faith even though I went to Sunday School as a child. If I would have been asked the question by somebody on the street, "Are you a Christian?" any of the time while I was a drug addict and an alcoholic and a New Ager and all that stuff, I would have replied, "Well, sure, because I remember that time when I was in the Sunday school class in the Methodist Church where my grandparents sent me to when I lived with them in West Virginia as a child. And so, I had a misconception about Christianity. Believe me, a lot of people in our churches, let alone a lot of people in the streets of America, do not understand who Jesus is. From the First Century to right now in the present, many have questioned, "Who was this Jesus?" The Pharisees began to question Jesus and asked, "Who would forgive sin, or have the power to do that?" They believed that Jesus was committing blasphemy because of the things that He was saying. His disciples marveled when He calmed the waves and the storms, and they asked, "What manner of man is this, that even the winds and the sea obey Him?" The Pharisees indignantly badgered Jesus the night before His crucifixion, "Tell us who you are," they demanded. At the foot of the cross, their own centurion pondered, "Truly this was the Son of God." So, a lot of people through the ages in Jesus' day and since had wondered about who He is, and who He was. How important is the question: "Who is the real Jesus?" It may be the most important question any of us could ever ask. So many people are interested in forms of religion, but if you don't have the identity of Jesus right you will lose you soul for all of eternity. I may repeat that in a minute, but it is really something that you need to hear. The identity and the deity of Jesus Christ and who you believe He is determines your eternity. What could be more important than that? So many very sincere people have some sort of Jesus or one of the many counterfeits, but not the real thing. They are lost in the process. You can find this in the Scriptures as Paul warned the Corinthians in 2 Corinthians 11. Paul said, "But I fear, lest by any means, as the serpent beguiled Eve through his subtlety, so your minds should be corrupted from the simplicity that is in Christ. For if he that cometh preacheth another Jesus, whom we have not preached, or if ye receive another spirit, whom ye have not received, or another gospel, which ye have not accepted, ye might well bear with him." In other words, you might put up with it and you might not know the difference, because Paul was talking about the gullible Corinthians who were one of his most troublesome churches. A different Jesus, a different Gospel, and a different spirit — because of these I believe we are truly at the end of the end times. How many believe this is where we are? If we are truly there, then there is going to be a proliferation of error, and it is going to be voiced within the Church as well. The Devil is not going to leave the Church alone. He wants to trip us up. He doesn't want us to have the victory. And, he certainly doesn't want us to preach the victory to the lost around us. He doesn't want us to have the right conception of who God is and of who Jesus is. Jude's letter is a distress call, a distress call against false teaching. Jude was going to write something completely different, but instead he stops and the whole tenor of the letter becomes a warning to the Church about false teaching. He was going to write about the great salvation we all enjoy, but instead he turned toward his concern over false teaching. Paul in his letters to Titus and Timothy warn about false teaching and several other places, and Jesus warns us an astounding 14 times in the four Gospels about false teaching and false teachers. This is an integral part of the Scripture which cannot be ignored. So many people in the "feel good church," what I call the here and now Church that we see all around us in that they are only interested in the here and now and not about eternity, refuse to talk about this. So many pastors won't pick it up and talk about it because they think it is a negative topic. But, no, this is part of the message that we've got to be true to. We are warned again and again that if we are in that time of the end of days, then we certainly have to know about these things. In Matthew 24, Jesus warns us in this great end time teaching. He warns us about false christ's and false teachers that were coming. He was very explicit about it. And understand, just because the word "Jesus" is being used, it may not be the real Jesus. Just because a sports star can spell J-E-S-U-S doesn't mean he is talking about the one who died on the cross. Let's be careful we don't make theologians out of people who are not fit. Second Corinthians 11 comes alive to me more and more each and every day of my life. And so, we must be prepared to proclaim the real Jesus, the divine Son of God, against these false Christs. In the next segment of Eric Barger's sermon on "The Truth of Jesus' Divinity," we'll examine the cultic Jesus of Mormonism. Get back to the Word and the absolute essentials of the Christian faith by learning how to defend what you believe in this 6-part conference album! Order your copy for $25 today! i must disagree with eric on 1 point: last i checked, king county was less churched than pierce county which is just south of where i live....it has however been awhile since i checked tho. regardless the whole western side of washington is very religious yet very unchristian. also a good church is xtremely difficult to find here in the northwest. unlike the bible belt...andtexas being the buckle of the belt. Pierce or King...they are indeed in a race. Tacoma News Tribune published a story several months back stating that Pierce was the least churches county nationwide. The Gospel of John identifies clearly that this same Jesus is God, Creator of the universe we live in. The living Word of God made flesh. Many professing Christians today fail to recognize this fact. If the Lord is then the living Word of God clothed in flesh, born of a virgin, then to know Him is to partake of the Bread of Life daily. To consume the Word of God and let it strengthen the New Man, to quench our thirst in the dry desert in which we have wandered by drinking in the Spirit of Truth. The Word of God states clearly that faith comes from our hearing of the Word of God and our embracing of it, as the seed is planted within us, it springs forth being watered by the Holy Spirit. If we are not being fed with the Word of God and daily consuming it ourselves, then how can we abide, or where will come our faith and strength. If we have no knowledge of scripture, we can not know whom we serve, nor can we abide in the faith. If we do not know Jesus, we can not confess Him before men, for we remain lost ourselves.